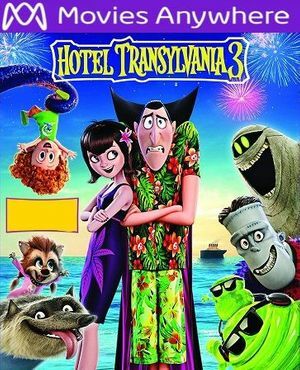 Digital UltraViolet and Digital Copy will makes it possible for you to stream the movie Hotel Transylvania 3 HD UV or iTunes Code via MA instantly to your computer and compatible Smartphones, Andriod, iphone, iPod Touch, iPad and tablets devices anytime, anywhere. You can also download a Digital UltraViolet Copy or a Digital Copy of the movie Hotel Transylvania 3 HD UV or iTunes Code via MA to your computer and compatible devices. When the original "Hotel Transylvania" was released, I'm afraid to say I never caught it in the theater. I instead waited until it came to DVD to check it out, and immediately regretted not seeing it on the big screen, for I loved the simple, but funny plotline, and all the loveable and relatable characters. So much so, that the movie is now a staple for my folks and I to watch every Halloween. (And it helps that Genndy Tartakofski of "Dexter's Lab" and "Samurai Jack" fame directed it and had a hand in the writing.) And while I thought the sequel wasn't as up to par as the first, I still enjoyed it enough that I was excited to see this third outing with our favorite crew of monsters. The verdict? While the first movie is still the most superior of the trilogy, I found this new adventure far more enjoyable and memorable than the second film. With the success of the hotel and Mavis and Johnny's happy marriage, life is going well for our merry band of monsters. But with all this success comes very little free time for Dracula and his family....not to mention the fact that Dracula grows more and more lonesome by the day and seeks companionship (whether he wants to admit it or not). So Mavis surprises her dad and her friends with a luxury cruise vacation trip....but what is Dracula to do when he finds himself falling in love with the beautiful ship's captain? Especially when said captain is the granddaughter of famed monster hunter VanHelsing, who's plotting to eliminate all the monsters once and for all? All of the characters that make these movies great are back in full form, and are just as charming and funny as ever. (There's a monster-themed joke practically every five minutes--all of them hilarious.) The animation is bright, fast, and fluid, with almost every minute filled with something or someone moving--making every scene funny even when no one's talking. And now that the characters are on a cruise ship, it opens the door for even more hilarious and clever situations that couldn't have happened if they stayed cooped up in the hotel. This also leads into a plot that, to me, is far more memorable and carries more weight than the second film did. The first film had a simple, solid plot that carried all the way through, about Dracula learning to accept humans. In the sequel, humans have accepted monsters as a part of their everyday life, which, while charming, pretty much negated any sort of dramatic tension the first movie had. Thankfully, the human/monster conflict that was present in the first film and elevated it beyond just being a silly cartoon is brought back again here in the form of the monster hunter, VanHelsing, who refuses to let go of the past and will stop at nothing to see his old enemies destroyed. So much so that he's conditioned his granddaughter to hate monsters as well....which makes things all the more awkward for her when she finds herself bonding with and falling for Dracula. Which, speaking of Dracula, he too gets another character arc, in which he struggles with the notion that he can fall in love a second time (when it was previously believed that monsters only "zinged" once), and wonders if he'd be betraying the memory of his deceased wife or not. While the two don't have as many bonding moments as Mavis and Johnny did in the first movie, their conflict and situation is still far more interesting and compelling than what the second film had to offer. And with that, we're given thoughtful messages about finding new love, spending time with your family, letting go of the past, and forging your own path to happiness, even if it means going against your elders. Let's be clear, this trilogy isn't going to win any Oscars. Anyone above the age of 12 will probably be able to guess the plot and see certain gags or story beats coming a mile away. These movies aren't trying to be super "deep" or anything....and that's okay. Not everything has to be Disney level quality. Some movies just need to be pure entertainment, and if the audience happens to learn a lesson along the way, so much the better. The slick and expressive animation and great characters are a joy to watch, and while the first movie will remain the best, this new installment takes everything that was lacking in the second film and either improves it or fixes it. If you liked the first two movies, you'll like this one too, and if this is the last film we spend with the hotel gang, it was a great note to end on.